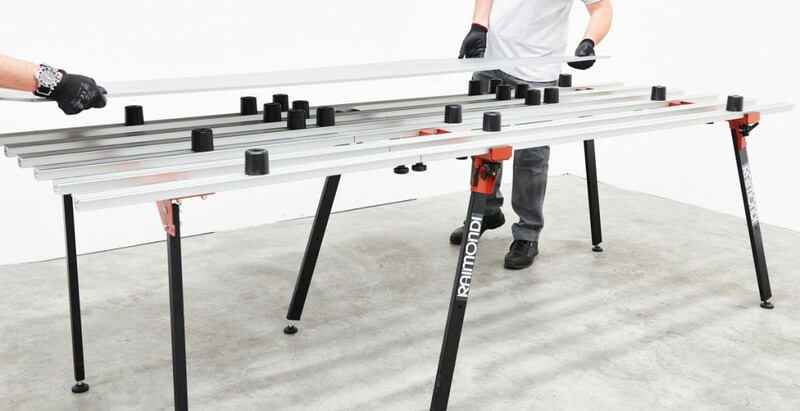 BM 180 PLUS is a variable width table designed to be the perfect workstation for large format tiles up to 160 cm (5.3’) and to be easy to transport. 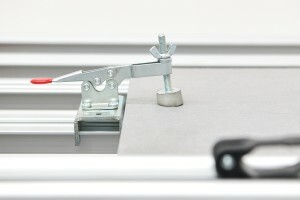 With few simple movements, the width of the worktop can vary from a minimum of 100 cm (3.3’) to a maximum of 150 cm (5’) with intermediate steps. 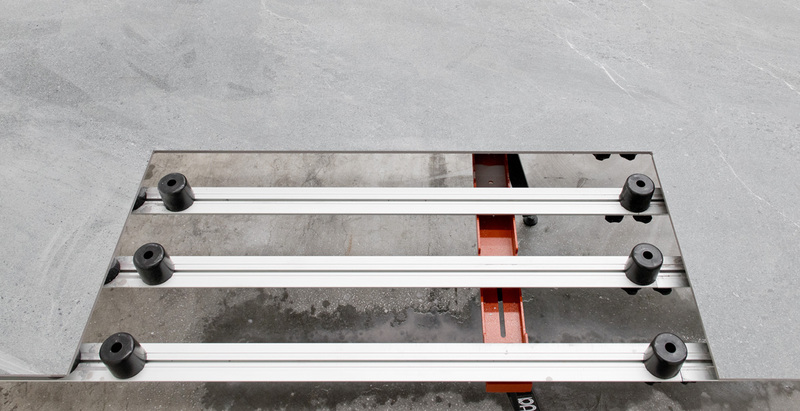 In order to obtain an optimal worktop for any chosen width, the aluminum profiles are easily movable. 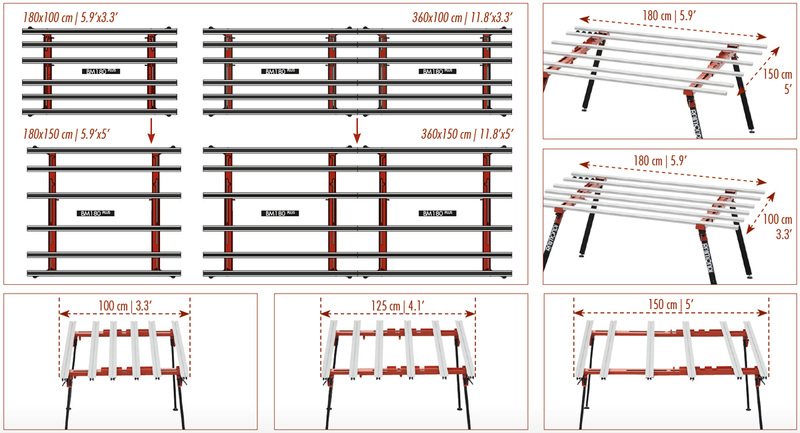 When changing the width of the table the legs move as well, therefore they always maintain the optimal position to guarantee the maximum stability and strength of the bench at any chosen width. The length of the top is 180 cm (5.9’). 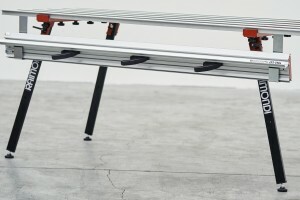 Connect two tables together to obtain a worktop of 360 cm (11.8’) in length (and variable with from 100 to 150 cm – 3.3’ to 5’). 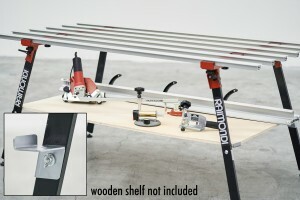 This feature makes the BM180 PLUS the perfect workstation for slabs of any size. When in minimum width position, the bench is compact and easy to transport and store. Its folding legs make it even more practical. Being the anodized aluminum profiles (which make up the worktop) spaced and movable, it is possible to perform cuts with angle grinder and diamond blade without damaging them. 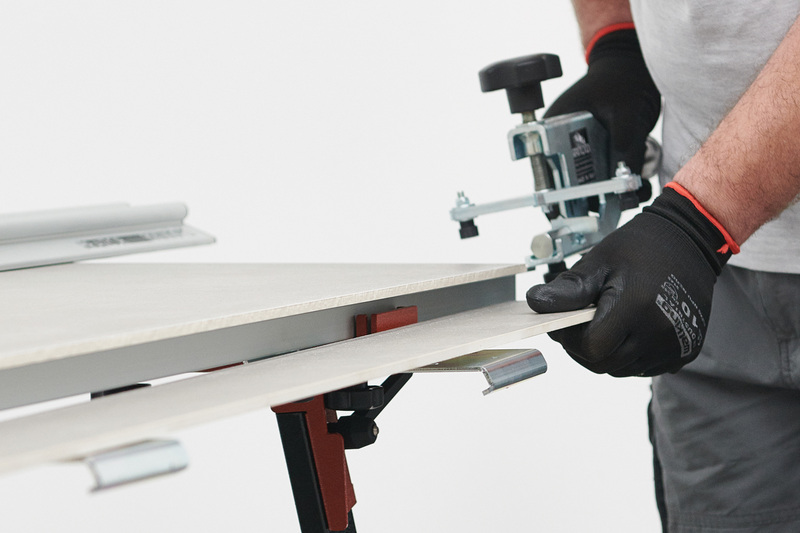 Moreover, the special tile-support-cylinders (available as an accessory) create a gap between the tile and the worktop allowing to perform cuts with angle grinders in every direction without damaging the bench. Legs provided with adjustable feet for perfect leveling of the bench. The steel structure and the worktop made of anodized aluminum profiles assure maximum strength and stability. It possible to eventually add extra aluminum profiles (accessory). 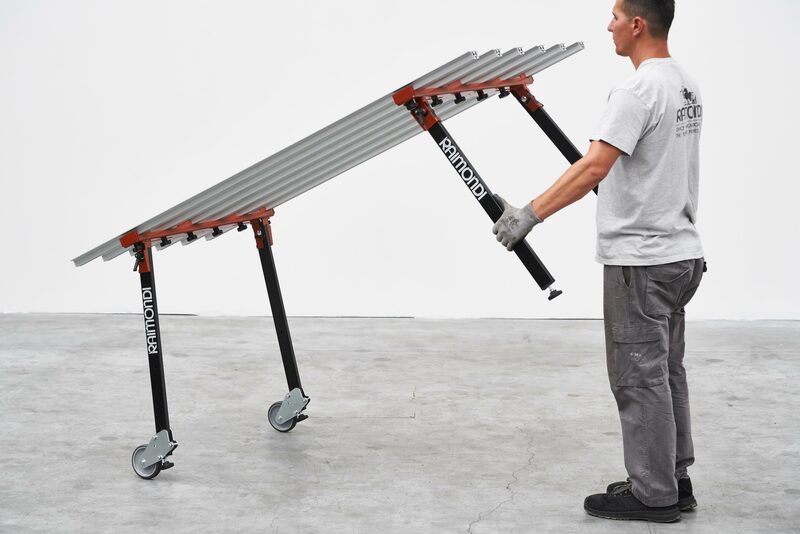 Maximum load capacity: 150 Kg (331 lbs). Once mounted on the working bench BM180 PLUS, the kit of 20 polypropylene supports (h 56 mm; Ø 60 mm) are designed to keep the slab lifted with respect to the bench aluminum profiles, always giving a stable worktop. The lifted position of the slab from the bench profiles allows to perform cuts with angle grinders in every direction (e.g. 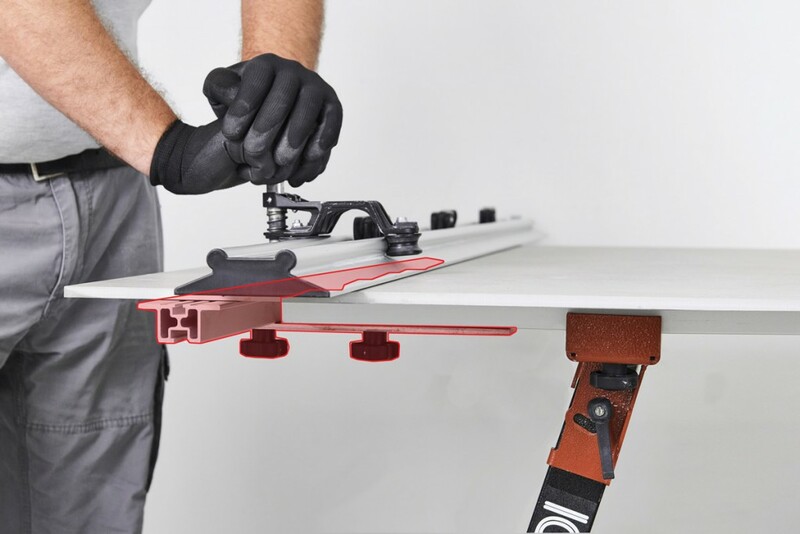 ; perpendicular to the holes between the profiles) without having to worry about the risk of touching/damaging the underlying worktop with the diamond blade. 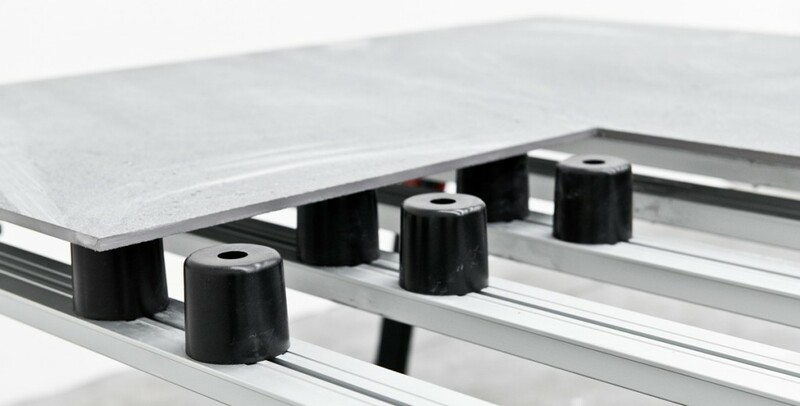 The possibility to freely place the supports in any point on the surface of the bench allows to optimise the layout in order to obtain the best stability and support for the slab. 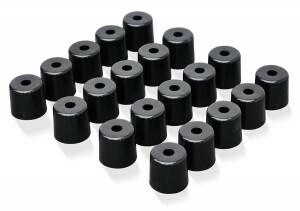 This also in the most difficult situations and for the most complex cuts, such as square and rectangular holes. The assembly of the supports is extremely easy and fast: just insert them by sliding the underneath screw in the apposite groove and fix them in the desired position through a slight rotation. 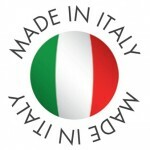 In plastic material and extremely resistant, studied to last for a long time and to be reusable virtually forever. 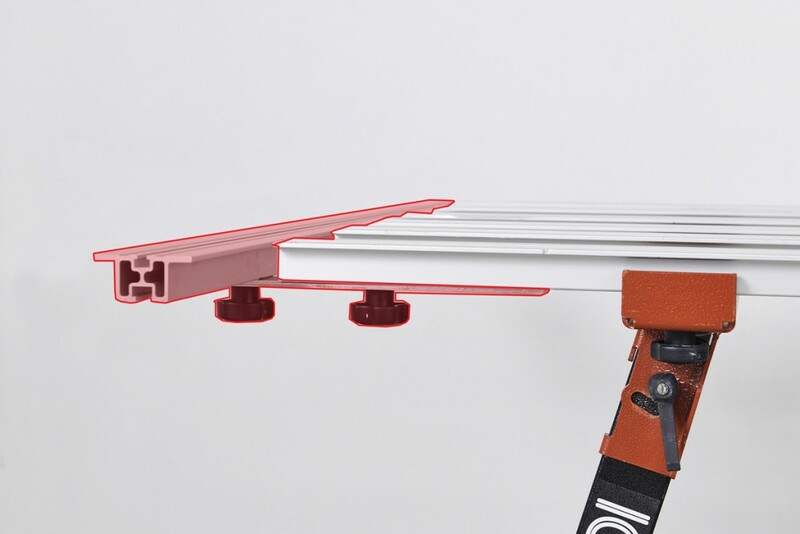 The supports can be mounted exclusively on BM180 benches with grooved aluminum profiles (see the picture above). The supports do not preclude the use of the wide range of accessories for BM180 PLUS neither the use of the POWER RAIZOR accessories, like the kit for wet cut and dust suppression (Art. 433PWW A) and the dust containment device (Art. 433PWZP A). 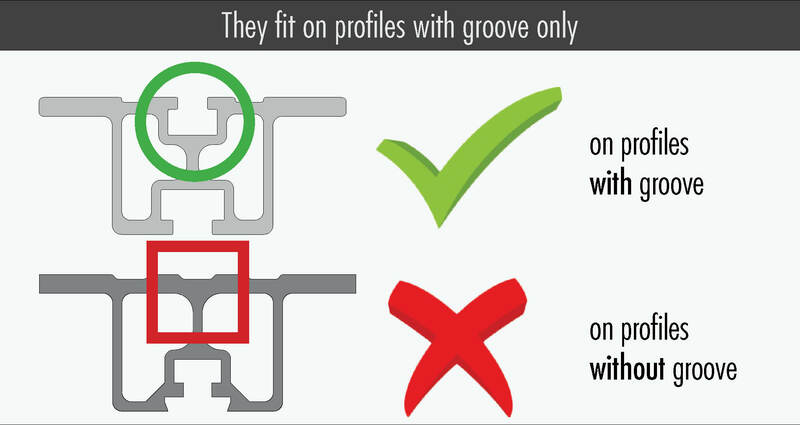 The side profile connects to the short side of the table offering a continuous support for score & cut the short side of the tile (i.e. : cut 120 cm side of a 120×240 cm tile). Available in two lengths: 124 cm and 164 cm (4’ and 5.4’). Therefore, suitable even for the largest tiles. 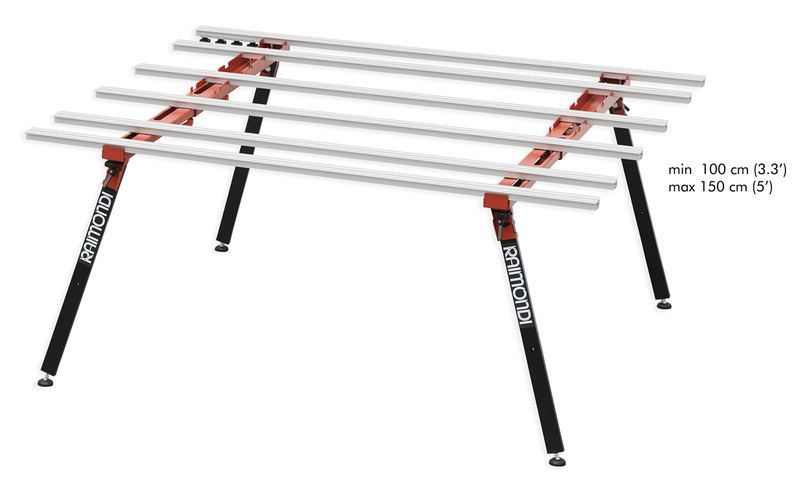 We recommend the use of the 164 cm (5.4’) version only with BM180 PLUS. Version 124 cm (4’) fits on both BM180 MkII and BM180 PLUS. Free to slide in and out when mounted so to not interfere with operator when doesn’t need them.